A good single serve coffee unit can help you enjoy a similar experience to a gourmet coffee shop at a fraction of the price. So, if you like indulging in gourmet coffee on a regular basis, one of these machines can save you a lot of money over the course of a year. With the stylish Keurig K45 Elite Brewing System, you can have coffee, tea, hot chocolate or iced drink in less than a minute, which is a lot faster than hanging around in a line at your favorite coffee shop, especially during the morning rush. Why bother fighting the crowds in the morning when you can enjoy coffee that’s just as tasty without the hassle and annoyance? And yes, you can get all those fancy drinks too and you don’t have to put any extra energy into creating them yourself because they come ready-prepared in K-Cups. If you’re more of a traditionalist, the really cool thing about the Keurig K45 is the K-cup reusable coffee filter, which you can use your preferred coffee or loose leaf tea in. So, this unit is extremely flexible, making it a great option for even the most discerning coffee enthusiast. It also features three different brew sizes, namely 6, 8 and 10 fl oz. The large water tank that comes in at 48 fl oz ensures that you won’t have to refill it after every cup you brew. The unit also features a detachable drip tray and power saving mode that shuts the unit off after two hours of not being used. It also includes Quiet Brew technology that makes it one of the least noisy units on the market. The Keurig K45 is the epitome of convenience and has the ability to brew an outstanding cup of coffee. Along with the wide variation of K-Cups available, it’s pretty much like a gourmet coffee shop bundled into a small yet highly powerful unit. The fact that you can get over 500 variety of beverages from 75 different brands ensures that you will always be able to find exactly what you want and every member of the family will be able to enjoy their beverage of choice. Keurig actually means proper in Dutch, which the company chooses to interpret as meaning excellence and this unit is proof that the company upholds their extremely high standards. We owe the automatic drip-brew coffee maker to the Bunn-o-Matic Corporation, the same company that manufactures the BUNN MCU Single Cup Multi-Use Home Coffee Brewer. The unit features four brewing drawers that can use ground coffee, K-cups, tea pods, loose-leaf tea and so on. It’s pretty much the best option for anyone who wants to have a wide and very flexible selection of beverages. Considering BUNN mainly manufactures products for commercial applications, it shouldn’t come as a surprise that this unit has a somewhat industrial look, though it’s still attractive in its own right. It’s also a very durable unit that is extremely functional. This unit has been part of wide range of taste tests and it has mostly been the winner as it brews an excellent, full-flavored cup of coffee. It should be noted that this single-serve coffee machine doesn’t have a water reservoir, which means you need to add water each time you brew coffee. However, some consider this a benefit as it means fresh water is used every time a beverage is brewed. It also features a Pulse Brew option that enables the brewing of a cup of coffee with an extra strong flavor, which many consider an excellent feature. A small issue some had with the unit was that they needed shorter travel mugs, though some have overcome this issue by simply removing the silver drip tray, which provides sufficient space for tall travel mugs. A highly attractive single serve coffee unit, the Hamilton Beach Single Serve Scoop Coffee Maker doesn’t need pods or K-cups as it works with regular ground coffee thanks to its mesh scoop filter. You can use a wide range of coffee grind types, allowing you to brew whatever brand of coffee you like and whichever flavor you prefer. This unit also features two brewing options, namely Regular and Bold. As you can imagine, Bold makes for a stronger, more full-flavored cup of coffee, while Regular produces a standard cup of coffee. Standard, though, is a misnomer as it still results in an excellent tasting coffee but one that isn’t quite as powerful as you can get using the Bold option. The Hamilton Beach Single Serve Scoop Coffee Maker can brew up to 14 fl oz of coffee at a time and you can use both regular coffee mugs or the travel version. It has a cup rest that is vertically adjustable so tall travel mugs can fit but you can also make sure that regular coffee cups are as close as you can to the dispenser to avoid spillage or splashing. 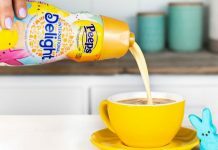 The only real issues with this unit are that it takes a little longer to clean up than with pods or K-cups and that you need to fiddle a little until you get the perfect brew for your tastes. Of course, this is also true for a regular percolator so these aren’t really insurmountable problems but mild annoyances. So, if you want a really delicious cup of coffee, you really can’t do better than this Hamilton Beach coffee maker. This is the smallest unit in the Nespresso range, as the name implies. Don’t let its small size fool you because this extremely stylish unit has the ability to brew one of the tastiest cups of espresso you’ll ever have the pleasure of drinking. Keep in mind, though, that if you’re looking for a unit that can brew regular coffee too, this is not the unit for you. On the other hand, if espresso is your beverage of choice, the Nespresso Pixie Espresso Maker is the machine for you. As you can imagine, this unit uses only Nespresso capsules to brew different flavor espresso, including Full & Balanced Roma, Creamy Arpeggio, Rich & Distinctive Capriccio and more. Despite being dedicated to brewing espresso, you can see you still have plenty of flavors to choose from. One advantage this espresso maker has over regular units is that there is no guesswork involved. Simply pop in a pod and let the machine do its thing, which will result in an outstanding cup of espresso every time. Note that you can also enjoy an espresso Lungo or Americano, which is a cup of espresso with extra hot water added, by simply pushing the brew button again. The Nespresso Pixie reaches the ideal temperature for brewing espresso in a mere 25 seconds, which makes it one of the fastest in its class. It can do this thanks to the Thermoblock heating element it comes with. Another great feature is the power saving mode, which shuts the machine off after it hasn’t been used for 9 minutes. It also makes clean-up extremely easy because used capsules are ejected into a special receptacle inside the unit. All you have to do is empty every once in a while and that’s it. The Mr. Coffee BVMC-KG6-001 Single Serve Coffee Machine relies on K-Cups to brew the beverage of your choice, whether it’s coffee, hot chocolate or tea. One of the most cost-effective options on this list that is K-cup compatible, this unit also works with the K-cup reusable filter so you can brew coffee from fresh coffee grounds and tea from loose leaves. Note that the filter has to be purchased separately. This until also features three different brew sizes, namely 6, 8 and 10 fl oz. It’s also extremely simple to use and quite attractive and robust considering the cost. One slight issue with the unit is that it doesn’t have a brew strength option. However, considering that other, more expensive units have the same issue, the Mr. Coffee Single Serve Coffee machine is still an excellent choice if you don’t want to invest in a higher-end single serve coffee unit right away. 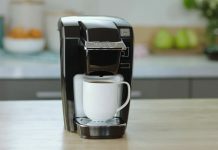 Thought the Keurig K45 definitely tops our list as the best overall unit, all the other single serve coffee machines we featured are more than capable of meeting even the most discerning tastes. In other words, you can confidently buy any of the single serve coffee unit we featured and you’ll be more than pleased with the results. 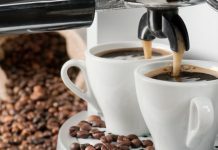 Like with any type of coffee machine, there are certain things to consider before going out to buy one of the best single serve coffee machiness on the market. Let’s take a look at what they are. There are a wide range of single serve coffee machines on the market and the main difference lies in the types of coffee and tea they can brew. This is why you need to research what’s available for each unit. Some of the more popular brands are Nespresso, Keurig, and Tassimo. So, before you buy, take a look at what types of coffee you can get for each unit to see if they include your favorites. Likewise, some units are single scoop, meaning that you can use regular ground coffee in them, or feature capsules, K-cups or pods. Other single serve units brew only espresso. The type you get will largely depend on the beverages you want to brew, as some units have pods or cups available for coffee and tea as well as hot chocolate. Though many people consider the price of the machine first, what you really need to be looking at is the operating costs, meaning how much is it going to cost you for every cup of coffee you make. Capsules, K-cups, and pods vary in price, ranging from $0.3 to $0.7 per unit, and once you buy a specific machine, you’ll be forced to use that particular form of capsule, so make sure that you opt for one that falls within your monthly coffee budget. Of course, even at the higher end of the price range, they’re still a fraction of the cost of a coffee from a gourmet coffee shop. While single-serve coffee unitss only brew one cup of coffee, that cup can differ in capacity. So, if you prefer to drink espresso, for example, you might only need a unit capable of brewing 4 to 5 fl oz. On the other hand, if you want more coffee in one go, then a unit that can brew up to 12 fl oz might be a better choice for you. Like with any appliance today, you have various options in terms of features. Some units have a gazillion features and are comparable to a spaceship, while others are as simple as can be. So, make sure to research the various features available in each unit and decide whether you really need them or not. For example, if you like having your coffee ready as soon as you open your eyes in the morning, then maybe a unit that is programmable might be best for you. But if you also forget to get it ready the evening before, then the additional cost of such a feature might not be worth it for you. An interesting function some units have is that the water is constantly heated so that the machine will take less time to brew your coffee. The problem with this feature is that it’s constantly using energy to keep that water hot, which could have a significant impact on your energy bill. So, if you don’t mind waiting a little longer for your coffee and would rather avoid the higher energy bill, then maybe you should skip this feature. Though some units might be slightly harder to use than others, they are all so easy to use that this isn’t really much of an issue. These coffee makers are simple and convenient, with little clean-up involved. They make drinking coffee so easy, you might find yourself indulging more often just because there’s so little effort involved.